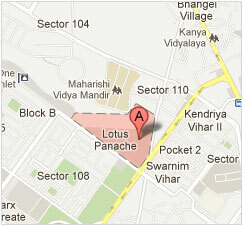 "Where everyday is Earth Day"
The 3C Company presents the new 'Green Zip Code', 'LOTUS PANACHE' in Sector-110, Noida. Spread across 41 lush green acres, this green Residential estate is strategically located opposite to already inhabited Sector 82, only 1 km from the Noida - Greater Noida Expressway. A enviable blend of sheer luxury and suburban lifestyle, Lotus Panache will be a step ahead in green developments. Showcasing a mix of 2, 3 and 4 Bedroom apartments, its architecture will present a host of economic, health & environmental benefits. Lotus Panache will house Asia's first "NET ZERO ENERGY Pre-Nursery Lotus Valley School. This green pre-nursery school is an effort towards providing the future generations with a healthier base for making them environment conscious. The hub of sports and leisure, 'Le' Panache, a 135,000 Sq. Ft. Green Club at Lotus Panache, will be Asia's first club, which uses GEO THERMAL technology. The unparalleled combination of green features and plethora of amenities offered by Lotus Panache are envisaged to make this 'Green Zip Code' the most sought after green address. Disclaimer: Prices are subject to revision/withdrawal without notice at company's Sole discretion.